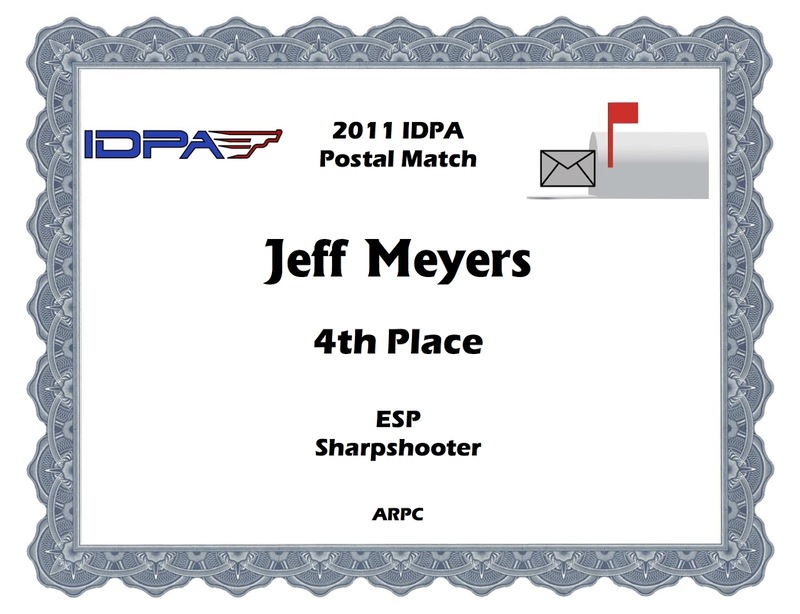 Today I got in the electonic mail my 2011 IDPA Postal Match certificate. Woo Hoo! I shot in two divisions at the match last September. What happens is that every IDPA club around the nation—and internatial clubs, too—set up the exact same 4 courses of fire to shoot. Everybody then turns in their score and you get ranked. I shot in two divisions: ESP and SSP. 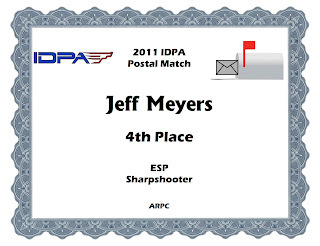 I came in 4th out of 179 Sharpshooters in ESP. Out of 129 Expert SSP shooters I came in 11th. The overall scores are not listed on the website, but they are not difficult to calculate. There were 2339 shooters in all divisions. My score ranked 55th of 2339 shooters. That's in the top 2% of all shooters. I'll take that. But I think I can do much better next year.